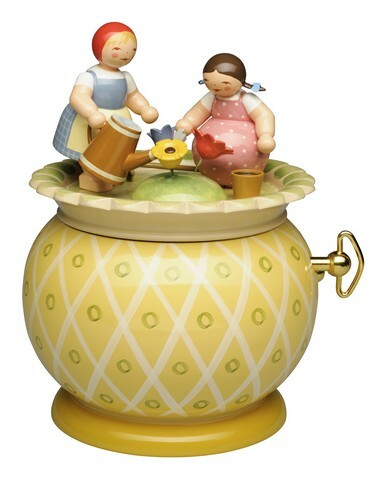 This beautiful music box was released by Wendt & Kühn in February of 2018. A lively, refreshing and cheerful scene featuring two girls gardening and cultivating their flower beds. It features the german folk song "Ward ein Blumlein mir geschenket" on an 18 note musical platform. It is a song about growing flowers which aligns with the theme perfectly. The girl in the pink dress is using her trowel to plant flowers while her companion has laid down her rake to quickly water the flowers with a watering can. This particular design by Grete Wendt first appeared in the Wendt & Kühn catalog in 1933. Height is 5.5" tall.